Miss Rose filed her Income tax returns from Bangalore. While reading the Form 26AS and the Income Tax Returns, the Income Tax Authorities (“Authorities”) notice that the amount declared in the Income Tax Returns is less than the amount reflected in the 26AS. Hence, the authorities realise that there is concealment of income and wish to send show cause notice to Miss Rose. Now the question is there are hundreds of Rose’s who have filed their income tax returns. If the authorities, go on the basis of the person’s name, there is a high possibility of error. Probably, the notice might reach another innocent Miss Rose. To avoid such silly errors, the Authorities issue PAN (Permanent Account No). The Authorities recognise a person on the basis of their PAN. Income Tax Jurisdiction – What is it? How to find your Income Tax Jurisdiction? PAN is a unique ten-digit alphanumeric number allotted to a person under Section 139A of the Income Tax Act. PAN enables the department to link all the transactions of the “person”. These transactions could be with respect to payment of tax, availing TDS/TCS Credit, filing return of income, any correspondence with the Department, etc. Tax Payers are divided into different jurisdictions based on the areas to which they belong to. Tax Disputes of the assessee will be considered based on their respective jurisdictions. In case the assessee faces any issues and receives a notice from the Income Tax Department, then the assessee might have to meet the respective Jurisdictional Assessing Officer. 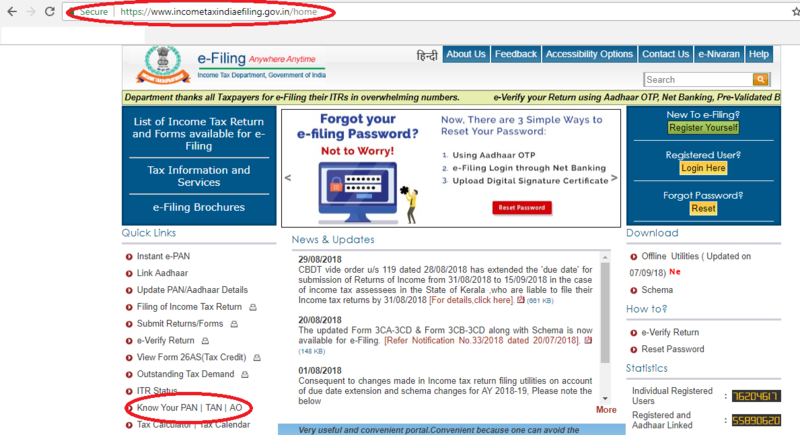 Go to the Income Tax E-filing website. Click the link ‘Know Your PAN’. The following options are available – Individual / HUF/ Association Of Persons/ Body of Individuals/ Company/ Government/ Artificial Juridical Person/Local Authority/Firm/Trust. The appropriate option needs to be selected from the drop-down list. The mobile number entered will receive an OTP. Enter the OTP and click on ‘SUBMIT’ again. Remarks – Whether the PAN is Active/ Inactive. Make sure to quote your jurisdiction in all possible places rightly to ensure correct details are available.